At al-Uqaybah at the end of Souq Saroujah there was a Khan (caravansary) well known for vice, called Khan al-Zanjari. The debaucheries and depravities were intolerable. Al-Malik al-Ashraf, Musa Ibn al-Malik al-Adel (Ayyubid era), was told that such thing should not be tolerable in a Muslim land, so he ordered it to be demolished and to build a mosque in its place. The people named it “ Jamie al- Tawbah” Mosque of Repentance, as though it had turned in a repentance to God and repented of what was in it. 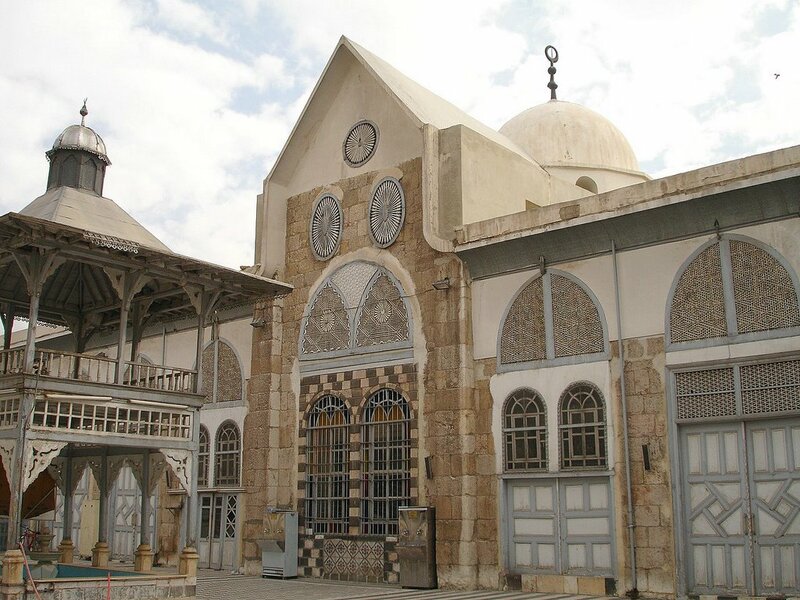 The mosque was built in 632/1234 with a great resemblance to Umayyad Mosque, somehow suggesting that repentance involve copying or imitating the most important and holiest local building in the country. Fun story and cute mosque. Interesting story, and beautiful structure! It looks like a nice mosque. Your pictures are very beautiful. Your writing is thoughtful. I loved the link to the music. I was surprised by the comment from the singer's sister. I live in Texas too. With your permission, I will put a link to your blog on my blog so my friends can read your great blog. (I want to get that CD "Traditional Songs of Syria!") You wouldn't think somebody born and raised in Texas would like that genre of music, but I do. I love the vocal style, the sinuous melodies and the rhythmic patterns. This is what I love best about the internet -- that it can cross distances, borders and cultures, and help two people meet and exchange ideas and experiences who would otherwise never be able to know each other. Just found your site via Kevin Sike's story on Yahoo. Awesome! I have enjoyed your site very much and it is one I will be telling others about on my own blog. Plus I have another website I will advertise it on. I think you will be getting a lot more hits after Kevin Sites articles. Of all 4 bloggers mentioned, I was most intrigued by your sight- it came off less political and more as an observation of your world. Your photos are beautiful and stunning! You should be proud of your abilities, and I look forward to continuing to read your posts. I think blogging in America is often about what is wrong in the world, and sometimes in their petty lives. You make me consider my own site- one to show the beauty in my life, not my daily difficulties or political rants. Again, I love your photography! Saw the article in yahoo concerning your blog. Tell us a little more about how you view Americans! Where exactly is that Masjid? 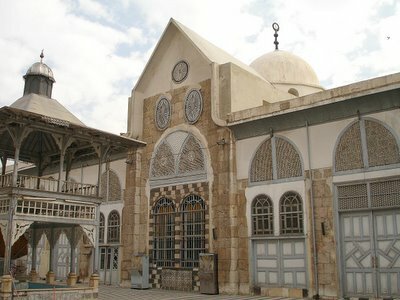 I studied in Damascus for 2 years but I never came across it. A new world. Thanks for the view. One such deception we call "suicide". The word "angel"
into the mind of man. stuck thinking that was what they really wanted to do. (we are most vulnerable here!). business....which took the place of Family, "soaps"
race, including those you love! as true evil, and that there is true goodness." [Dr. I wish to know more about your wonderful country. your map does not include israel...does that mean you deny the existence of the state of israel and wish its destruction? 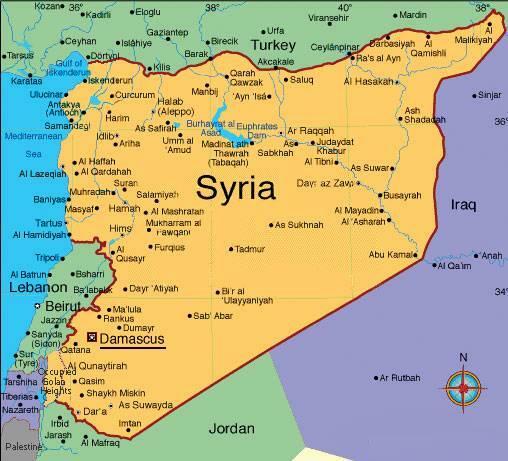 or is that the extremist view of that syrians tend to have so they exclude israel off their maps? Great blog, Ghalia. Found it through the Kevin Sites article. Love your writing style and your choice of topics. Beautiful snapshots in words and images of your country! Look more carefully. Israel is the purple country below Lebanon, with Nazareth in it. The brownish "Palestine" you see is the West Bank. I think they just didn't label it because they only showed a tiny piece of the country. But whatever. Why such a one-track mind? 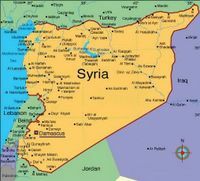 Why should a blog about life in Syria be obligated to crop its map in such a way that another country takes center stage? I'm American, btw, and support (most) US policies in the Middle East, but I'm glad to get a little insight into real life in Syria. Shukran gazeelan! I found your blog through the yahoo article also. The pictures and stories are beautiful. I have always wanted to visit that part of the world because of the historic value. Maybe sometime in the future this can be possible. Funny - it reminds me that across the board so many religious sites (Jewish, Muslim, Christian) have their origins in our "baser" instincts - in Christianity of course the holidays are superimposed over the Pagan feast days that celebrated some sort of depravity or other - and the churches or temples often occupy the sites of some Roman nonsense or other. Maybe the important aspect is that these spots are where people congregate for some reason or other. Ironically, one thing that all of the religions have in common (at least in their texts, if not in their practitioners) is the idea of jubilation, joyfulness, exhuberance - it's a shame we can't just declare a year of celebration like they used to in antiquity and put everything else on hold. But then there are always those who have a pipeline directly to god - and according to them he's more concerned about the kind of shoes we're wearing. I'm not sure I'd call this a blog. A log implies an ordered sequence of some sort. This is something different, possibly unique. Not sure there is a word for what you're doing, but whatever it can be called is excellent. The Internet has much information, but information is not the same as culture. The story is interesting. It depends on the exact beliefs of the place at the exact time - interpretations change over the ages - but there were many different ancient traditions that might explain at least some of what lay behind the copying. The news story that mentioned this site said there were only about 7 regulars. Hey, I think you'd rather 7 quality readers than a million idiots, but I'm sure there are more than 7 decent people in the world. Well, I hope so, anyway. Best of luck finding them! I think that what you are attempting to do for your people is extremely noble. Trying to get people, notably Americans, to understand a little more about who you are and what you stand for takes real courage, the kind of courage most people don't have. I applaude you.